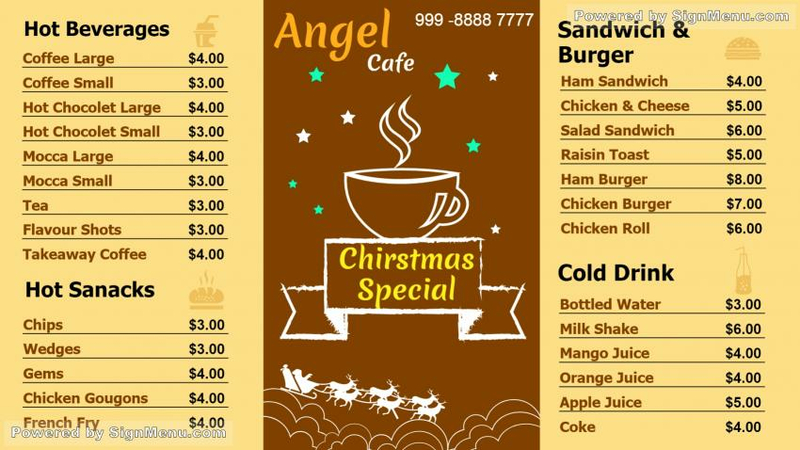 This template showcases the offerings of a cafe - a special menu for Christmas.This template is best showcased on a digital menu board and placed at the entrance of the restaurant as well as indoors. Virtually all restaurants look forward to occasions like the Xmas wherein they can innovate on their menu and offer unique recipes to their customers. Please note how the light shade colors compliment the darker ones in highlighting and profiling the restaurant brilliantly. This template is ready for download and use.